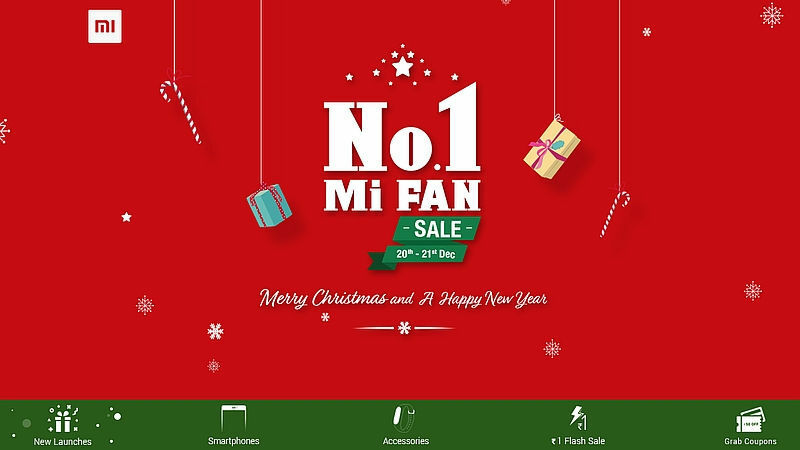 Xiaomi has kicked off the ‘No.1 Mi Fan Sale’ on Mi.com with offers on a variety of smartphones, mobile accessories, smart home gadgets, and other non-tech accessories. There are also open sales on popular mobiles, till stocks last. The Xiaomi sale is being held on Wednesday and Thursday. Starting with the contests on Xiaomi India’s official shopping portal, a Re. 1 flash sale will be held on both days at 2pm where users will get a chance to choose from a Redmi 5A Gold (2GB RAM + 16GB storage), a Mi VR Play 2 Dark Grey edition, a Mi Router 3C, a Redmi Y1 Lite (Gold – 2GB+16GB), a Mi Wi-Fi Repeater 2, or a Mi Band – HRX Edition. A limited number of units for all these products will be available for just Re. 1. The winner list will be announced at 2 pm on December 21. As for the open sales, the Xiaomi Mi A1: Special Edition Red at Rs. 12,999 (down from Rs. 13,999) is already available, while the Redmi Y1 at its regular Rs. 8,999 price will be available from 12 pm IST, December 20, and the Redmi 5A at its regular Rs. 4,999 will be available from 12 pm IST on December 21z subject to stock availability. Other Xiaomi smartphones like the Mi MIX 2 is available for Rs. 32,999 (originally launched at Rs. 37,999) and the Mi Max 2 is available for Rs. 12,999, down from the original Rs. 14,999. The Redmi 4 can be purchased starting at Rs. 8,499, down Rs. 1,000 from the original price. The Redmi Note 4, on the other hand, is available starting at Rs. 9,999. The Redmi Y1 Lite will be available at Rs. 6,999, down from its Rs. 7,999 price, from 12 pm IST on Wednesday. Xiaomi is offering up to Rs. 500 discount on both variants of the ‘Made In India’ Mi Power Bank 2i. The 20000mAh Mi Power Bank 2i is available at Rs. 1,499, down from Rs. 1,999 on Wednesday, while the 10000mAh Mi Power Bank 2i is available at Rs. 799, down from Rs. 1,199 on the same day. The Mi Band HRX Edition Black is available at Rs. 1,299, down from Rs. 1,799, on the same day. Audio accessories are also on discount. The Mi In-Ear Headphones Basic is available for Rs. 499 while the Mi Capsule Earphones are available at Rs. 899, down from Rs. 999. The Mi In-Ear Headphones Pro HD is available at Rs. 1,799, down from Rs. 1,999, while the Mi Bluetooth Speaker Basic 2 is available at Rs. 1,799, down from Rs. 2,699. Finally, the Mi Bluetooth Speaker mini is available at Rs. 899, down from Rs. 1,299 . The Mi Band strap – HRX Edition is on sale for Rs. 199, down from Rs. 299; the Mi Car Charger is available for Rs. 699, down from Rs. 999, Mi VR Play 2 is selling for Rs. 1,299, down from Rs. 1,499, and the Mi Bluetooth Headset (currently out of stock) can be bought at Rs. 899. Other non-tech accessories like the Mi Business Backpack is available, in the No.1 Mi Fan Sale, for Rs. 1,299 down from Rs. 1,499; the Mi Crewneck T-Shirt Black is available at Rs. 499 down from Rs. 549; the Mi Car Charger is available at Rs. 699 down from Rs. 999, and finally, the Mi VR Play 2 is available at Rs. 1,299, down from Rs. 1,499. Xiaomi is running app-exclusive coupons, with up to Rs. 500 in cash discounts, which go live at 10 am on both days of the sale. MobiKwik is also offering up to Rs. 4,000 in Supercash and Hungama is offering 3 months of Humgama Play and 12 months of Hungama Music.